← Quality Time: how does it feel? 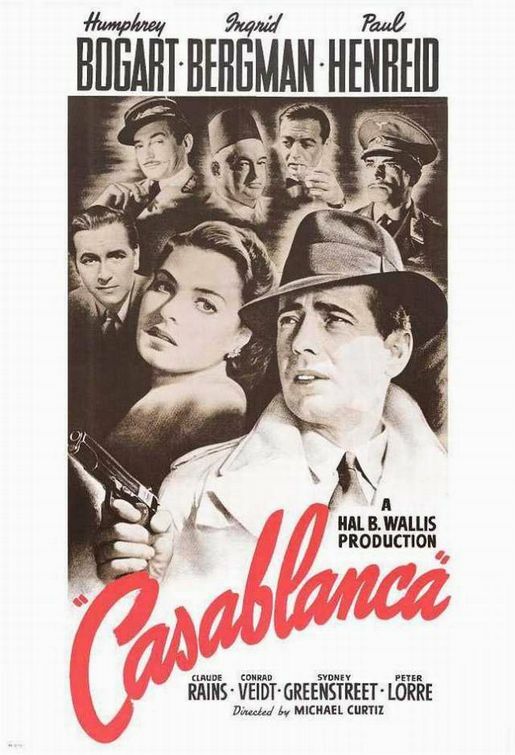 As the well-informed readership of this blog will know already, in the 1942 film Casablanca, nobody ever says that most famous phrase “Play it again, Sam”. They use similar words, but somehow, the whole world has picked up the wrong version. 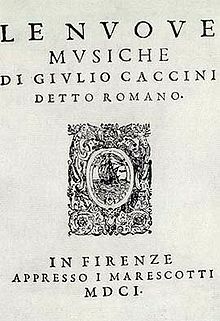 In this post, I’m looking again at what Caccini actually wrote in his famous Preface to Le Nuove Musiche (Florence 1601/2), separating the facts from popular myths. Actually, he only mentions sprezzatura twice, in the whole Preface. He only uses it once, in all his extensive music examples. Sprezzatura was not his priority. Sprezzatura was applied only to whatever did not matter. In contrast, he talks much more about divisions and exclamations, and he uses these much more in his example songs. His priorities were text and rhythm. If you perform early seicento music, don’t trust what your teacher once told you his teacher told him, don’t even accept what I write here without proper scientific scepticism: you will want to read Caccini for yourself. The standard modern edition (Giulio Caccini, edited by H. Wiley Hitchcock, Le Nuove Musiche, A-R editions, 1970, second edition 2009) is widely available, and includes an English translation of the Preface. That translation has a few questionable moments, but it includes well-researched additional notes. 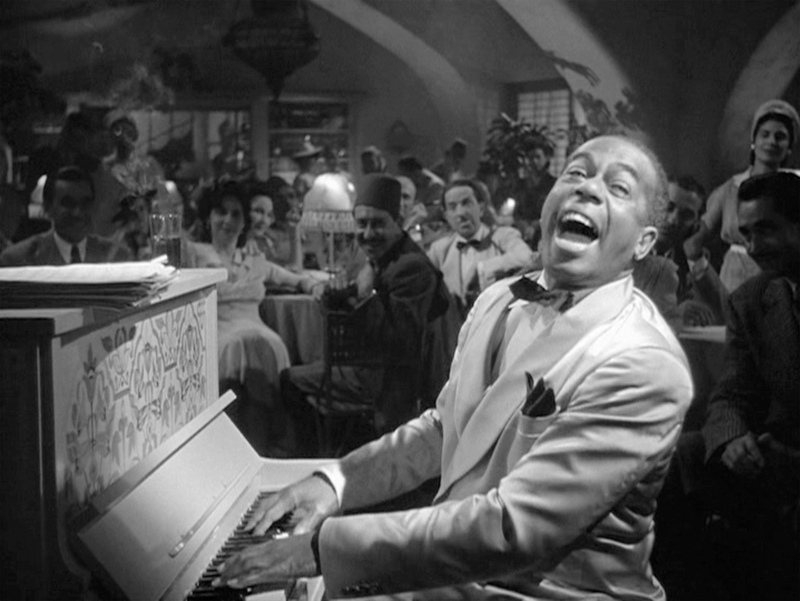 But be careful with Hitchcock’s transcriptions of the songs themselves: not all the printed time-signatures – vital for establishing Proportions – are original. Probably the most influential English translation is Oliver Strunk (editor) Source Readings in Music History (1950), page 370. The 1942 translation by Alfred Ashfield Finch has many editorial additions, and cannot be trusted: I mention it only because it is available online. The extract translated by Zachariah Victor is better (though he mistranslates sprezzatura di canto), it can be downloaded free here. But best of all, the original print can be downloaded free, with the full Italian text of the Preface, Caccini’s worked examples (in which he applies his own advice to three sample songs), and all the songs themselves, including his greatest hit, Amarilli mia bella. It’s all here. In Baroque Music 1.0, we all learnt that Caccini’s Le Nuove Musiche represents the paradigm-shift that brought about a musical revolution, defined Basso Continuo, ushered in the Baroque Age, and led to the Development of Opera. 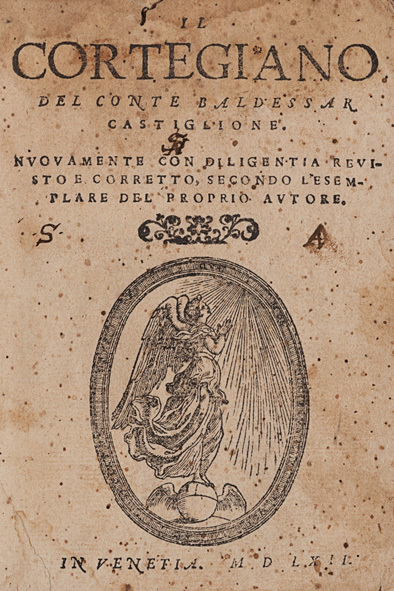 That over-simplistic view has been re-assessed: Caccini was a clever self-promoter, and in this book as in his hasty publication of his music for the ‘first opera’ Euridice (1602), he was deliberately positioning himself as the hero of a new style. Caccini’s Musiche are not really so nuove (new); in many ways, he was less innovative than his rival, Jacopo Peri, principal composer of the first-performed version Euridice (1600). Similarly, Caccini’s advice on performance practice is a summary of developments over the last decades, rather than an ‘epoch-making’ breakthrough. Again, Peri is more daring, in the Preface to his Euridice, which I will discuss in a future post. The songs of Le Nuove Musiche include 12 strophic Arias which Caccini calls canzonette a aria, ‘Canzonets’, and plenty of ‘old-fashioned’ diminutions, even in the 12, supposedly more modern, ‘Madrigals’. These madrigals look very much like the ornamented solo versions of four-voice part-songs heard in the Florentine Intermedi (1589). Indeed, it’s so simple an exercise to construct a four-voice madrigal from the solo and figured bass of Amarilli mia bella, that I suspect Caccini originally wrote the piece as a part-song. As Victor Coelho writes, “we know now through the work of Claude Palisca, Tim Carter, John Walter Hill, Howard Brown, and others, that Caccini’s works were closely connected to earlier and long-standing musical traditions”. 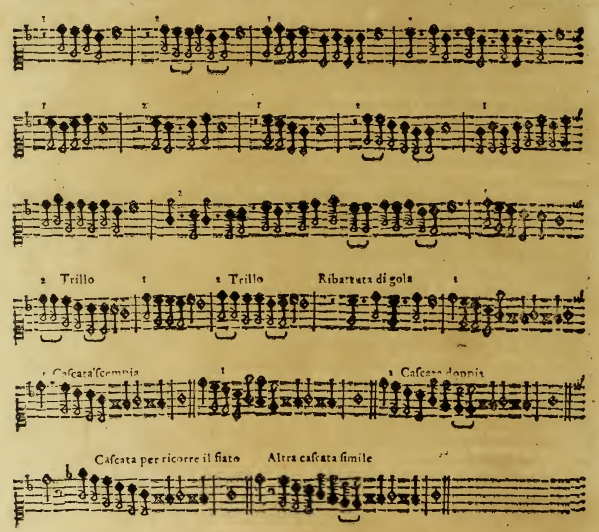 Coelho’s article in the Journal of Seventeenth-Century Music here places Le Nuove Musiche in the context of the previous century and of a manuscript containing intabulated accompaniments of works by Caccini, Peri, and Rasi . In modern editions, sprezzatura is translated as ‘disdain’ [which is literal, but unhelpful] or ‘nonchalance’ [better]. I like the translation ‘cool’. Castiglione links sprezzatura to grazia (grace, elegance), a word so evocative of the qualities of an ideal Courtier that it occurs 150 times. Sprezzatura occurs a further 8 times, in connection with dancing, as not to be overdone, as praiseworthy in itself, in contrast to attillatura (neatness of dress, also seen as praiseworthy in itself), in contrast to affectation (seen as highly negative), in contrast to ‘pestiferous affectation’ and linked to the ‘extreme grace of simplicity’, and in the context of playing a character role in costume. To wear a character costume brings with it a certain liberty and licence. Amongst other things, it allows a man to take the form of something that he feels to be of great worth, and to exercise careful attention and preciseness about the principal purpose of the event in which he wants to appear, but a certain ‘cool’ about whatever doesn’t matter. This greatly increases his elegance. Attillatura usually refers to preciseness in dressing, but it seems that Castiglione intends this example to illustrate a more general concept: even when you are doing something very important, you can be attentive and precise about the important things, and show a certain ‘cool’ in whatever does not matter. Returning to the 17th century and Le Nuove Musiche, we can hear echoes of Castiglione in Caccini’s use of such words as sprezzatura, grazia and nobil (noble, which with its derivatives occurs 122 times in Il Cortegiano). But which words and phrases does Caccini use most often, what is his ‘principal purpose’? Caccini calls his practice la nobile maniera di cantare (the noble manner of singing), and says he learnt it from Scipione del Palla, who was active in Naples at the time of Caccini’s birth, 50 years earlier. He claims for himself the development of lunghi giri di voci semplici, e doppie, cioe raddoppiate, intrecciate l’una nell l’altra (long turns of notes, simple and double, i.e. re-doubled, interwoven one with another). He positions these as the modern alternative to quella antica maniera di passaggi (that old-fashioned manner of divisions), which he considers more suitable for wind or string instruments than for voices. He associates la buona maniera di cantare (the good way of singing) with crescere e scemare della voce, l’esclamazione, trilli e gruppi (crescendo and diminuendo of the note, exclamation, single-note trills, two-note trills with final turn). As the Preface continues and in the example songs, it becomes clear that crescendo and diminuendo are on one note, not throughout a whole phrase, and precisely what is meant by trillo and gruppo. He now discusses the advantages of canto per una voce sola (solo songs, as opposed to polyphonic part-songs). He claims that recent times (moderni tempi passati) were not accustomed to musiche da quella intera grazia (music of that complete grace) that he himself hears nel mio animo resonare (resonating in his spirit). Grazia has connotations of divine, spiritual qualities as well as of artistic beauty and sweetness. Animo is the mind or spirit, as opposed to anima (the spirit or soul, in the religious sense), core (heart, fount of emotions), and the lower body, vita. Caccini values what he learnt at Bardi’s Florentine Camerata, with its membership of noble amateurs, musicians, intellectuals, poets and philosophers, above his long training in counterpoint. These intendentissimi gentilhuomini (gentlemen of great understanding) convinced him not to prize that kind of music which does not allow the words to be understood well (non lasciando bene intendersi le parole), because it spoilt the meaning and the poetry and distorted the Long and Short syllables. [Long and Short syllables correspond to Good and Bad notes; more about Good and Bad here]. La musica altro non essere che la favella e’l rithmo, & il suono per ultimo, e non per lo contrario. Music is text and rhythm, & sound last of all, and not the other way around. Caccini and the Camerata want music to penetrare nell’ altrui intelletto e fare quei mirabili effetti (penetrate the listener’s mind and create those marvellous effects) described by Classical writers, i.e. moving audiences to tears and laughter. This cannot be done by polyphonic music, not even by solo songs to a string instrument if there are too many diminutions, moltitudine di passaggi, applied indiscriminately to Bad as well as Good syllables [the normal rule is to ornament only the Good syllables]. According to Caccini, only plebs admire such empty vocal display (passaggi … della plebe esaltati). Such music can do no more than titilate the ears. It’s impossible to move the mind, muovere l’intelletto, without an understanding of the words, senza l’intelligenza delle parole. So Caccini had the idea [he writes, boldly claiming the territory] to introduce a kind of music in which performers could quasi che in armonia favellare – almost speak in harmonies. [This is paralleled in Peri’s more detailed description, in his Preface to Euridice, of taking the pitches of syllables that would be sustained in declamatory speech, and accompanying those pitches with suitable harmonies.] In this music, Caccini uses a certain noble sprezzatura of song, a ‘cool’ way of singing. Caccini describes how the voice-part passes through various dissonances whilst the bass stays on the same note – what we today call recitative. [This is a kind of sprezzatura of composing, a nonchalant way of dealing with the normal rules of counterpoint. These dissonances are not prepared and resolved, as would normally be required.] Sometimes Caccini does use dissonance in the conventional manner, with the polyphonic ‘inner voices’ played on an instrument, to express some emotion, per esprimere qualche affetto. According to Caccini, this was the origin of those modern solo songs which have more power to delight and move, piu forza per dilettare e muovere, than many voices together. [‘Delight and move’ recalls the Rhetorical aims of docere, delectare, muovere in Cicero’s De Oratore.] Caccini gives examples of his work – Perfidissimo volto, Vedro’l mio Sol, and Dovro dunque morire. [The first of these makes considerable use of the ‘recitative’ technique of a static bass, the second has one brief moment of ‘recitative’: in the third, the bass often moves fast under a sustained note in the voice. The common element of modernity seems to be reduced polyphony, rather than ‘recitative’ as such.] Caccini picks out his setting of the eclogue of Sannazaro [now lost] in particular as in the style of his music for the first Florentine ‘operas’, quello stile proprio … per le favole … rappresentate cantando. Caccini now name-checks various nobles who had never before heard music for solo voice accompanied by a simple string instrument, which had such force to move the emotions of the spirit tanta forza di muovere l’affetto dell’ animo. He attributes his success to his new style, lo nuovo stile, and also to the superiority of his specially composed solos over arrangements for solo voice of part-songs. By 1601, everyone who writes for solo voice uses this style, especially in Florence, where Caccini claims to have worked for the Medici for 37 years. Caccini again mentions the proper distinction between Good and Bad syllables, observed in his harmonies and his ornamentation. When he does ornament a Bad syllable, this doesn’t last long, and can be considered not as a passaggio (which would be inappropriate) but as un certo accrescimento di grazia si possono permettere (a certain increase of grace, that can be permitted). But since he has already complained about the misuse of long turns of notes, malamente adoperati quei lunghi giri di voci he advises that the passaggi are not strictly necessary for the good manner of singing necessarii per la buona maniera di cantare. Rather, they titillate the ears of those who understand less about passionate singing, una certa titillatione a gli orecchi di quelli che meno intendono che cosa sia cantare con affetto. For those who understand, passaggi are hateful, abborriti, there is nothing more contrary to emotion, non essendo cosa piu contraria di loro all’ affetto. This is why Caccini spoke about ‘misuse’: his own ornaments are introduced only in music that is less passionate, meno affettuose, on the Good syllables not on the Bad, and at final cadences. For these lunghi giri the vowel u is better for sopranos than for tenors; the vowel i is better for tenors. Other vowels are in common use, but open vowels are more sonorous than closed, and therefore more suitable for exercising such vocal agility esercitare la disposizione. Again Caccini tells us to use these giri di voci according to his rules and not just anyhow, e non a caso. Whilst others who want to sing solos stylishly, cantar solo e fare maniera think first about the practice of counterpoint, Caccini has better advice about the good manner of composing and singing in this style, la buona maniera di comporre e cantare in questo stile. [This distinction between comporre and cantare supports the interpretation of his sprezzatura di canto as a performance practice of ‘almost speaking’, not as the compositional technique of ‘recitative’.] What is needed much more is l’intelligenza del concetto, e delle parole il gusto (the understanding of the meaning, and the flavour of the words). This flavour should be imitated in passionate notes and also expressed by singing with passion, l’imitazione di esso cosi nelle corde affettuose, come nello esprimerlo con affetto cantando. [Again, Caccini distinguishes between the work of composer and performer]. So counterpoint is not much use, Caccini uses it only to coordinate the two parts, to avoid obvious errors, and to create some dissonances, durezze, more to support the emotion than to employ artistry, piu per accompagnamento dello affetto che per usar arte. Composing according to the gusto del concetto delle parole (flavour of the meaning of the words) and singing with good style, buona maniera di cantare, are more effective and delightful than all the art of counterpoint. This is what brought Caccini to this way of singing maniera di canto for solo voice, and where to use the lunghi giri di voce. Now he discusses the use of crescere e scemare della voce, l’esclamazioni, trilli, gruppi (crescendo and diminuendo on one note, exclamations, single-note and two-note trills). These are often used indiscriminately, indifferentemente, in passionate music, musiche affettuose, where they are required more, and in light dance-songs canzonette a ballo [where they would be inappropriate]. Some people create an ultra-passionate manner of singing, una maniera di cantare … tutta affettuosa, and with the general rule that crescere e scemare della voce and esclamazioni are the foundation of that passion (affetto), they apply them in all kinds of music, without noticing whether the words require such passion, se le parole il richieggiono. Those who understand well the meanings and sentiments of the words, che bene intendono i concetti e i sentimenti delle parole, can distinguish where such passion is more necessary or less required, ove piu o meno si richieggia esso affetto. This Art does not admit mediocrity. The more exquisite details there are that are required for excellence in this Art, the more hard work and diligence we who profess the Art must find in all our studies. [So, stick with it, even if Caccini’s sentences sometimes seem endless!] From written sources [the Italian word scritti hints at holy scriptures] we receive the light of Science [this word has cosmic, divine significance in the 17th century], and all the Arts. So we need Love too, the kind of love that inspired Caccini to leave a glimmer of light in his music and discussion of the art of singing solo above the harmony of the Chitarrone or other stringed instrument. For singers, the first and most important fundamental is to be to start the phrase on any note l’intonazione della voce in tutte le cordi , neither too low nor too high, and in good style, la buona maniera. Caccini discusses the ornamental start from a third below, which should be not be sustained but scarcely hinted at, a pena essere accennata. This does not always fit the harmony, and is often over-used. Many singers consider starting with a steady crescendo to be the good style of putting forth the voice with elegance, la buona maniera per mettere la voce con grazia. Caccini prefers this crescere la voce, but he is always seeking novel means to attain the goal of the musician, il fine della musico, cioe dilettare e muovere l’affetto dell’animo. A musician’s goal is to delight and move the passions of the mind & spirit. But the most principal means of moving the passion, mezzo piu principale per muovere l’affetto, is the Exclamation, esclamazione. As you make the decrescendo, nel lassare della voce [this could also mean ‘just before you leave the note’], make a bit of a crescendo, rinforzarla alquanto. Caccini notes that this crescendo can become unbearably harsh in the high part, especially with falsettists. But without doubt, as a passionate ornament (affetto) to move the emotions (per muovere), the effect (effetto) is better starting the note with decrescendo, intonare la voce scemandola, than with crescendo. [Note that Caccini here uses affetto to mean not only a passion, but also an ornament that moves the passions.] Crescendo la voce per far l’esclamazione (crescendo on a note as an Exclamation) requires a further crescendo as you relax/leave (lassar) the note, and this seems forced and harsh, sforzata e cruda. But contrariwise, with decrescendo on a note (scemarla), as you relax/leave it (lassarla) giving it a bit more spirit, il darle un poco piu spirto, makes it more and more passionate, sempre piu affettuosa. You can also vary one or other intonazione. Variety is most necessary in this art, as long as it is used for the purpose [of delighting and moving the passions]. This is the greatest part of elegance in singing in order to move the passions of the spirit, maggior parte della grazia nel cantare atta a poter muovere l’affetto dell’ animo. It applies to those subjects in the text (concetti) that are more suitable for such passions, ove piu si conviene usare tali affetti. You can learn this most necessary elegance, quella grazia piu necessaria, from written sources, but after studying the theory and the rules, perfection is attained through practice. This leads Caccini to his music examples, demonstrating two Exclamations, languida (languid) and piu viva (more lively). You can experiment to see which way of starting the note (intonato) produces more or less elegance, maggiore o minor grazia. On the word cor, start (intonare) the first note, make a decrescendo little by little (scemandola a poco a poco), and on the second note crescere la voce con un poco piu spirito (crescendo on the note with a little more spirit). This is the esclamazione assai affettuosa (moderately passionate) for a note descending by step. On the word deh, the exclamation is much more spirited, molto piu spiritosa, because it does not continue by step, but very sweetly with the fall through a sixth. 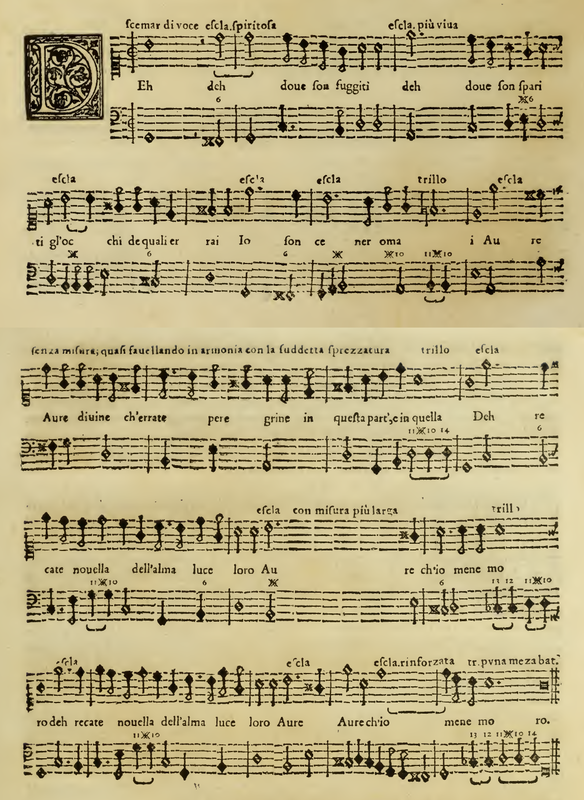 With this Caccini demonstrates the esclamazione, which can be of two qualities, one more passionate (piu affettuosa) than the other.The way the note is started (intonate) is an imitation of the word, imitazione della parole, as long as that word has significant meaning, significato con il concetto. Otherwise, as a general rule esclamationi can be used in any passionate music (tutte le musiche affettuose) on every occurrence of dotted minim plus crotchet [this is my reading of Caccini’s ambiguous phrase, tutte le minime e semiminime col punto]. They will be more passionate (affettuose) if the following note runs fast (corre). Don’t do them on semibreves, where there is more space for crescendo and diminuendo on the note (crescere e scemare della voce) without esclamazioni. In light music (musiche ariose) or little dance-songs (canzonette a ballo), instead of these passionate ornaments (affetti), just use the liveliness of the voice (vivezza di canto), which usually comes from the rhythm of the song itself [aria in this period has a wide range of meaning: a repeating rhythmic unit, a tuneful song that includes such repeating rhythmic units, or a tuneful strophic song over a repeating ground bass]. If there are some esclamazioni, they should leave the same liveliness (vivezza) and not bring in any languid emotion, affetto alcuno … languido. Musicians need to exercise their own judgement, beyond the rules of Art. In the example above, there is more elegance, maggior grazia, in the first setting of the word languire with the second quaver dotted, than in the second setting with all four quavers equal. There are many elements which create maggior grazia in the good manner of singing la buona maniera di cantare. Although they are written in one way, they make a different effect (effetto) in another way, so some are said to sing with more grace, others with less, cantare con piu grazia o meno grazia. The Trillo is on one note. Caccini taught it this way to his two wives and daughters. It starts with a crotchet, and beats with the throat (ribattere …con la gola) until the final breve. [Note that the trillo gets faster, not slower, and flows directly into the final breve]. Similarly with the Gruppo. Listeners could report how exquisitely, in quanta squisitezza, these were performed by Caccini’s second wife. Learning the Trillo and Gruppo is a necessary first step towards many things described here, that are effects of that elegance that is most sought after in good singing, effetti di quella grazia, che piu si ricerca per ben cantare. They are written one way, and performed another to make a different effect (contrario effetto) than the usual. Here are all these effects (effetti) written in the same note-values, so that from written examples combined with practice one can learn all the subtleties (squisitezze) of this Art. In the examples above, the second version has piu grazia. The next examples (below) have the words underlayed, a bass for the Chitarrone, and all the most passionate movements, tutti passi affettuosissimi. By practising them you can acquire ever greater perfection, ogni maggior perfezzione. [It’s worth doing some simple counting. In the three examples immediately above, there are 13 mentions of esclamazione, 11 of trillo, the word gruppi occurs once and the ornament is written out 4 times. Sprezzatura occurs only once. Senza misura (without measure) also occurs only once, in response to a strong cue from the words errate peregrine (you wander afar, erratically). Punctuation separates that instruction from quasi favellando in armonia con la suddetta sprezzatura (almost speaking in harmonies with the nonchalance mentioned above). In the passage above, that nonchalance applied to voice-production, ‘almost speaking’, and not to rhythm. Text and Rhythm are described above as the two highest priorities, the elements that, according to Castiglione, would receive Attention and Precision. Monteverdi and others notate how such senza misura works in practice, with the singer floating in a cool way, over a regular bass. There are many descriptions of this practice throughout the baroque period and even as late as Chopin. In the Aria Possente Spirto from Monteverdi’s Orfeo, the singer’s ornaments do not coincide with the tactus beats, nor with the movement of the harmony from G to D.
Here is one possible realisation of Caccini’s senza misura, according to Monteverdi’s model, and following Caccini’s instruction (below) to make some notes just half their written length. The important points are that this senza misura applies to the voice-part, whilst the continuo continues in measure; that this special effect is used only once in all the examples; that this is not the sprezzatura that Caccini mentions in the next clause. Caccini’s commentary on the examples above is that they show all the best passionate ornaments, tutti i migliori affetti, which can be used within the nobility of this way of singing, la nobilita di questa maniera di canti. They show where to crescendo and diminuendo the note, crescere e scemare la voce; where to do esclamazioni, trilli and gruppi, and to sum up, all the treasures of this art, tesori di quest’ arte. These ‘treasures’ are not written into the songs that follow, but the examples above are models to be followed, according to the passions of the words, gli affetti delle parole. [Now follows Caccini’s only discussion of rhythmic freedom.] The noble way (nobile maniera) is not dominated by strict measure, often reducing the value of notes by half according to the ideas of the words, facendo molte volte il valor delle note la meta meno secondo i concetti delle parole. [See my realisation of Caccini’s example 3, above]. The noble way then gives birth to a song (canto) that’s cool, in sprezzatura as it’s called. There you can use all the effects (effetti) for the excellence of this art, l’eccelenza di essa arte: a good voice (la buona voce), and effective breathing (la respirazione del fiato). Sing solos to the Chitarrone or other string instrument. Since there are no other singers, choose the pitch that suits you so that you can sing full, natural voice (in voce piena e naturale) and avoid falsetto (isfuggire le voci finti). You waste a lot of breath faking or forcing, trying to ‘cover’ the tone. Rather, you need the breath to give more spirit to the crescendo and diminuendo on the note, per dar maggiore spirito al crescere e scemare della voce, to esclamazioni and all the other effects (effetti). Don’t run out of breath when you need it! There is no nobility of good singing in falsetto notes. Dalle voci finte non puo nascere nobilita di buon canto. It comes from a natural voice, at ease in all the notes (una voce naturale, comoda per tutte le corde). Use the breath only to show yourself as master of all the best passionate ornaments, padrone di tutti gli affetti migliori, which pertain to this most noble way of singing (nobilissima maniera di cantare). The love of this style and of all music burns in me by nature, and from years of study. This art is most beautiful (bellissima) and naturally delightful (dilettando naturalmente). By practising and teaching it, it becomes a true semblance of that perpetual motion of the celestial harmony, sembianza vera di quelle inarrestabili armonie celesti, from which all earthly good derives, awakening the minds of listeners to contemplation of the infinite delights of Heaven. 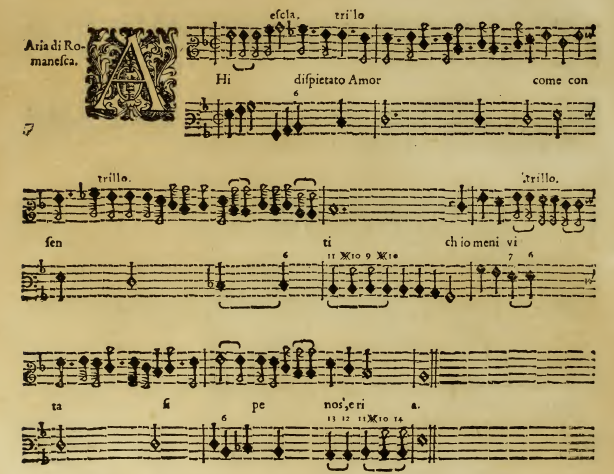 Caccini’s text is dominated by the interlinked concepts of affetto (passion, or a passionate ornament) and effetto (a passionate ornament or the effect of such an ornament on the listener’s passions). He mentions affetto and its derivatives 32 times: include the 8 occurrences of effetto, and this interlinked concept has 40 hits. There is also an exclamatione affettuosa in the first of the three example songs. This suggests that what is really ‘new’ about the nuove musiche is Caccini’s focus on passion (affetto), combined with the linking of such passion to a particular class of ornaments (affetti/effetti) and to the emotional effect on the listener (effetto). In his examples, Caccini has 13 esclamazioni, 11 trilli, 4 gruppi. Sprezzatura occurs only once. Senza misura only once. Con misura piu larga also only once. Caccini does not equate sprezzatura with free rhythm. The priorities for Caccini and the Camerata are Text & Rhythm. Sound is the lowest priority. Castiglione indicates that sprezzatura is applied to low-priority elements, suggesting that Caccini’s sprezzatura should be applied to Sound. Caccini’s phrases are sprezzatura di canto and canto in sprezzatura. He associates sprezzatura with ‘almost speaking’. Caccini’s sprezzatura is a nonchalant voice-production that is ‘almost speaking’. Caccini emphasises that although plebs might delight in flashy singing, the noble art depends on deep understanding of the words. Don’t sing so much, almost speak.